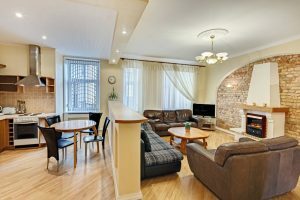 RIGAAPARTMENT self-contained apartments on a budget in Riga. Our aparthotel designed for Family living to be as independent as you want to be. Fully equipped kitchen, dining area, lounge and bathroom with laundry facilities. Accommodation for flexible traveler looking for an economic & value for money stay. A stylish and modern Studio flat consisting of a fully-equipped kitchen and sitting area with pull-out sofa and flat-screen TV. 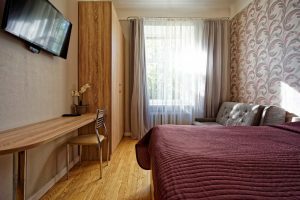 This is a warm and cosy flat consisting of: one bedroom with a double bed, a living room with folding sofa, bathroom with shower and an open plan kitchen equipped with everything you need during your stay. The flat is ideal for small families. The flat size is 37 square meters or 400 square feet. You can enjoy free wifi during your stay , Many of the cafes and restaurants are near to this place. This flat has a small luggage room. If you need any kind of information our reception is available 24/7. A two bedroom flat that accommodates up to a maximum of 8 people. Each bedroom has a king size double bed and a single bed. As an option is possible to use folding sofa in the living room. Flat feature a fully equipped kitchen. The bathroom can have a shower or a bathtub. One of the biggest advantages of the flat is the convenience and simplicity of the interior. This is a very stylish flat for a group of friends or a couple with children. A two bedroom flat with 6 single beds and pull-out sofa in the living room. Convenient stay for a group of friends. Flat consisting of: a bathroom with a shower and an open plan kitchen with everything you need during your stay. You can enjoy free wifi during your stay , Many of the cafes and restaurants are near to this place. This flat has a small luggage room . If you need any kind of information our reception is available 24/7. A very spacious flat with three bedrooms accommodates up to a maximum of 15 people. The living area joined with kitchen, has comfortable sofas and TV 32″. The bedrooms have different variation of beds depending on flat. There are: a spacious bathroom with bathtub, an additional separate toilet. Kitchen equipped with everything you need during your stay makes your trip more pleasant and convenient. You will like apartments in RIGAAPARTMENT GERTRUDA hotel!